I thought April would be a light month shopping wise because of the Easter holidays......not many kids are happy to shop but my daughter seems to be following in my footsteps as it is fast becoming her favourite pastime too! I was the best mummy ever for taking her to Westfield in London for the day.....I was flagging after 3 hours but she wanted to keep going!! Anyway I digress. I'd better start at the beginning of the month. 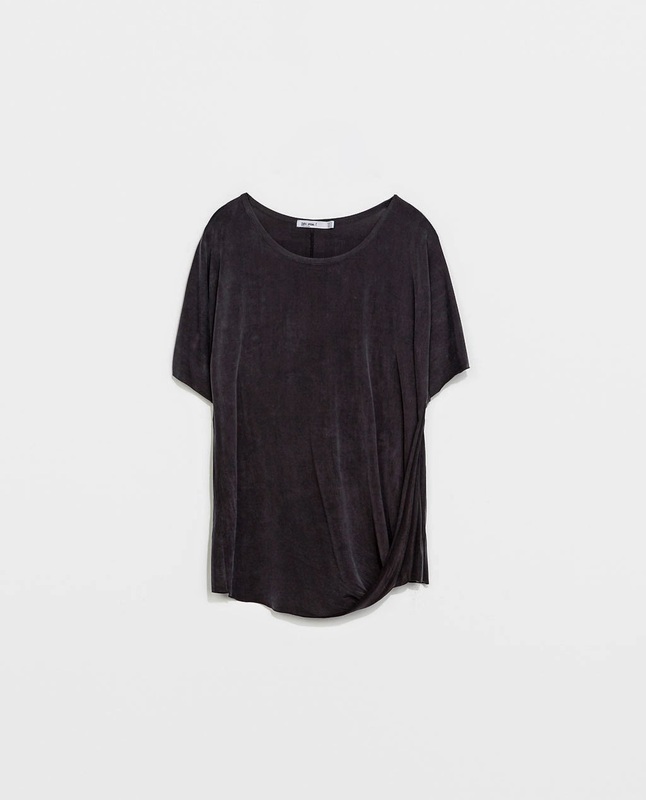 My first purchase was this cupro sport luxe look t-shirt from Zara. It would seem it is a special range called W & B Collection?! It has been a great purchase as I have worn it a couple of times already. It has a washed out look about it and a quirky little twist on the hem. It was quite pricey at £25.99 for a t-shirt but I knew I would get my monies worth out of it! Not entirely sure this picture is worth showing you but you get the gist about the twist! Right, next up is an item I have been hankering after a while. I have seen a few excellent blog posts on the jumpsuit but I have to say that after seeing the lovely Anne of I Heart Styling rockin' one for her birthday celebrations I set about finding one. I'm not sure how much wear I would get out of this so I didn't want to pay the earth. I saw this one in the Mango store, tried it on then ordered from ASOS as in Mango it was full price at £34.99 whereas on ASOS it was reduced to £20.50 and I managed to bag it with a further 15% off! You know how much I love a bargain! So this purchase gave me an excuse to indulge my latest obsession which appears to be shoes!! I bought a gorgeous pair of strappy black sandals from Zara last year but I only wore them once as I could hardly walk in the blasted things so I was looking to replace them with. Thanks to the fabulous Annemarie Fashion Mum of 40 I came to purchase these wonderful gladiator style sandals from M&S.....complete with the comfort cushion insolia! Happy feet! All I need now is an excuse to wear this outfit!! Sticking with the shoe obsession, my next purchase was indeed more footwear! I have been a nightmare with shoes since the start of the year! I have bought 11 pairs.....just call me Imelda!! Lol! I have actually sold 5 pairs on eBay so have *only* added to my collection by 6 pairs really.....don't you just love that justifciation! I'm about to have another huge wardrobe purge to try and justify a few more of these purchases. Anyway back to the latest pair of shoes. 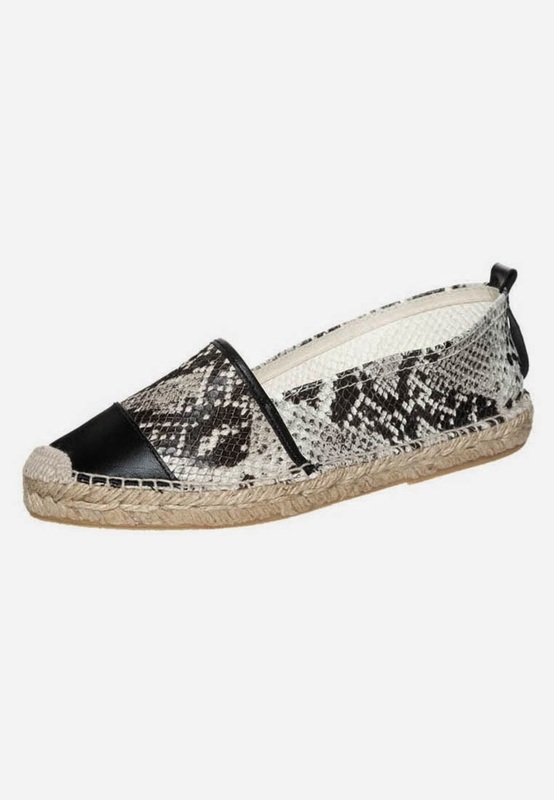 I have had so much wear out of my beloved Kurt Geiger Laurel skate shoes that when I saw these espadrilles online I was on a mission to make them mine! I did try and track them down in both my local Bristol & Bath stores but to no avail! The sales assistant in Bath kindly pointed out that they would be hard to get hold of (she spotted my Laurel's and commented they had sold out long ago!) as they were in the ad campaign.....red rag to a bull! Happy to report though that I found them on Zalando and they were £10 cheaper than on the KG website and as I was signing up to their newsletter I also got a further £10 off thus making them £65 instead of £85! This made me especially happy as I had just missed the wretched KG 25% off event which lasted until 31st March.....I just wasn't quick enough off the mark to snap these beauties up then! My next purchase was a hidden gem found on the sale rail in H&M for just £10! I was actually in the store looking for a black boyfriend style jean but when I came across these I knew they would be just the job! I seem to have accrued a lot of tops, a few dresses and as I mentioned, a lot of shoes but one thing I have overlooked in my wardrobe was the need for some new trews. These filled that gap just nicely....so much so I wore them 3 days on the trot....I would in fact still be wearing if the weather hadn't notched up a few degrees! They are a ripped up low waist skinny, and again I love them! They look great with skate shoes, the espadrilles and the Birkies.......perfect! This brings me onto the other pair of trousers I purchased! I was just about to order these online and in fact I had gone so far as to contact the wonderfully helpful Avril from School Gate Style so see what size she had as she was the inspiration behind these! As I mentioned above, as luck would have it my hubby invited me along on a work trip where I could spend the day at Westfield in London.....an offer I couldn't refuse! I've never been before so I jumped at the chance as I knew there was a Uniqlo amongst 100's of other stores making it my perfect playground :0) I was able to try these on in store and of course I snapped them up as they were just £14.90! 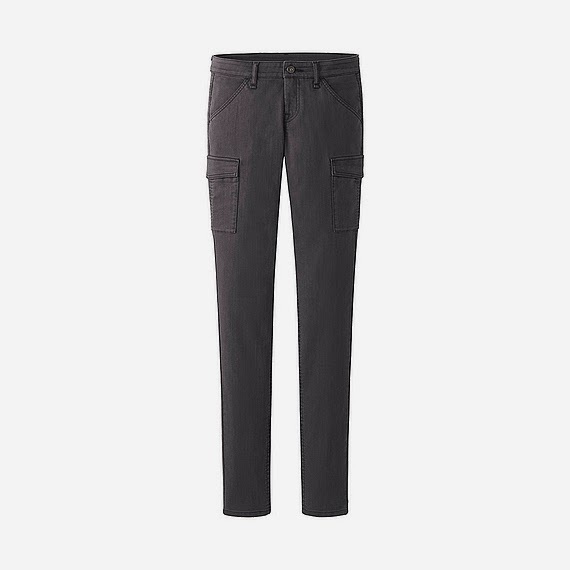 These are skinny cargo's in grey. If you are thinking of ordering on-line as Avril advised, size down as they come up big. I am normally a 28" waist in jeans, these Uniqlo ones are a 27" waist size 8. Here, with the Zara t! 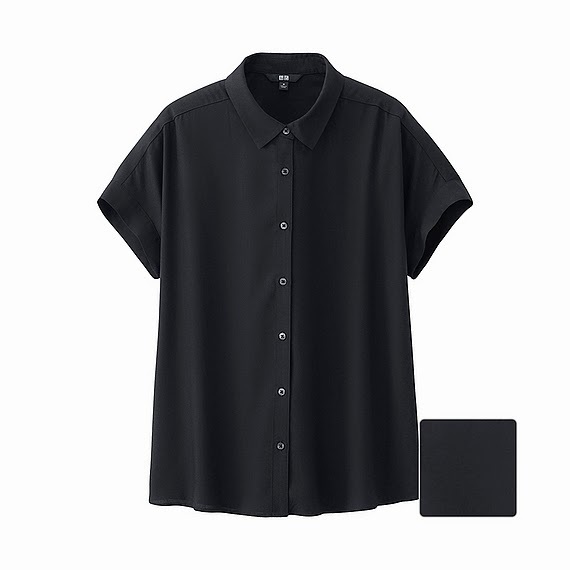 I also acquired this fab utilitarian looking cap sleeve shirt whilst in Uniqlo which was just £19.90. I so wish we had a Uniqlo shop near us as there seemed to be a lot more choice in store. Last but not least of my purchases is something altogether different. It's not black for a start! Shocker, I know! Especially after everything that has been purchased above but I walked in to the Mango store and clapped eyes on this....headed straight to the fitting room with it and then straight to the till! This dress is divine! It will be so lovely for my holiday, I knew I had just the right Grecian looking sandals to wear with it (years old from Zara) so it was a no-brainer.....I just cannot wait to wear it! Please tell me I am not alone with the shopaholic tendencies this month?! Anyone else care to share what they have added to their wardrobe so far this month? Here is the usual taster of what I've been wearing these past few days! I am officially shopped out now....goodness only know what I will find to write about for my next post?! I look forward to hearing your thoughts on my purchases and what you've been snapping up this month! As always I love reading your comments and responding to them! Michelle, you look amazeballs in the black jumpsuit. WOW. That is one thing I have never worn. The KG espadrilles are insanely gorgeous as are the strappy heels. You really found some gems this month. Love the animal print skaters too... I really must get a pair. Now for the Grecian looking dress - You look so beautiful in it! Gorgeous piece and sandals. I am so envious of your shopping budget - SO envious! Oh gawd.....it's honestly not as bad a budget busting month as it looks as I've been furiously flinging stuff on eBay in hope of off-setting some of these purchases!! I will need to stay away from the shops and sit on my hands for the rest of the month though!! Love that Mango dress Michelle & how stunning do you look in your new jumpsuit & what a complete steal too!!! You've made some great purchases....I may have purchased the odd few items which I'm totally blaming on this gorgeous weather!!! Thank you Sue! I'll be honest.....I find the gladiators a little tricky to get on but once they are on they seem manageable enough! They are probably not as comfortable as the snakeskin ones from last year....the lovely perspex heel is probably a tad more sturdy than the more stiletto type heel on these black M&S sandals. Heels are such a minefield for me now as I am just so used to flats, trainers, skate shoes and now espadrilles....I am not helping myself out here!! Wowsers, you have been on a mission! I have also been absolutely terrible this month! I love all the purchases but I have to say my fave is the jumpsuit, you look incredible in it and the shoes are perfect. Not alone, I've been terrible this year! I always seem to find loads of what I want all together then nothing for a while. Am praying for a drought soon......I absolutely love that Mango dress, it's right up my street. Thank God it's out of stock in my size online. Not near a Mango either but if I see it, will be trying it on. You look great in your jumpsuit. Hope you get an occasion to wear it out and about soon. I am going to have to get those snakeskin espadrilles now. I have been stalking them ever since I saw them in a mag. Can't remember which one though. If you think they are going to be a sell out I need to make my swoop soon. I already have the laurels like yours! I had to visit my brother in Sheffield to make sure I bagged a pair in my size as they were all sold out down south. Will strike whilst the proverbial iron is hot this time. Wow - Love the jump suit and shoes outfit - thats really nice. Love the Mango dress too - that looks gorgeous! I agree that we can't have too many shoes and those Autograph ones are fabulous and they are the ones with the comfy insole - even better! M&S seem to have really improved their shoe range lately.